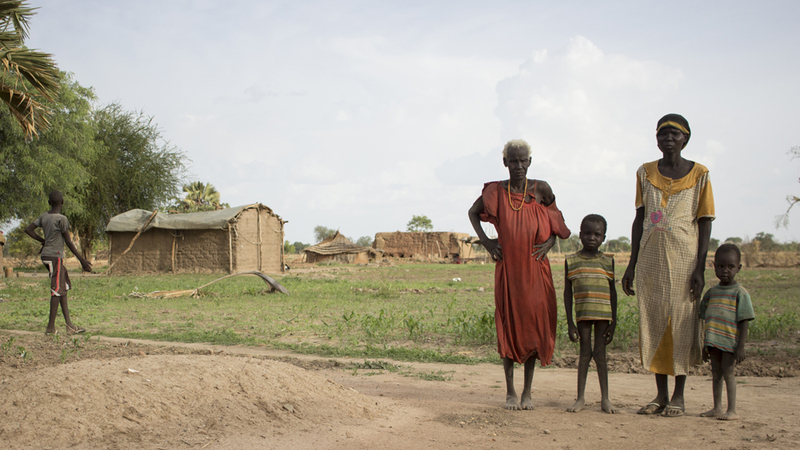 Kanjak, South Sudan- With thousands of people killed and almost two million displaced in a civil conflict that erupted in late 2013, South Sudan has disintegrated into chaos. Apart from violence that continues to strike this country, to make things worse, recent analysis of the situation says that the parts of the country are just weeks away from a famine. Northern Bahr el Ghazal, a region of South Sudan close to the border with its neighbor Sudan is usually self-sufficient in food, but because of drought in parts of the country, and an economic collapse , it is unable to provide for itself this year, 2016. According to the Aljazeera report, South Sudan has recently entered “phase 4”, an “emergency” on the Integrated Phase Classification (IPC) scale. What it means is that even with any humanitarian assistance at least one in five households in the area have large food consumption gaps resulting in very high acute malnutrition and excess mortality or extreme loss of livelihood assets that will lead to food consumption gaps in the short term. South Sudan depends largely on imports. The sharp increases in the prices of staple foods were due to the depreciation of the South Sudanese pound. The families are reliant on buying food from the market where prices have risen sharply, while their livelihoods have rapidly declined. The economy of South Sudan is largely dependent on oil exports as it has sub-Saharan Africa’s third-biggest reserves. The civil war that erupted two years ago has reduced the production of oil by about a third in the country. It has also been badly affected by plummeting oil prices internationally. The UN’s World Food Programme (WFP) in South Sudan currently has a shortfall of $106m in its food distribution budget. With no help underway, fleeing seems to be the only option. 38,000 have left the region surrounding Kanjak – known as Aweil East to Sudan, where prospects for families to feed themselves are said to be better. According to the WFP, since February about 7.6 percent of the population has left. In the past the UN has provided residents with sheets of corrugated steel, used as an alternative to the traditional thatched roofing. Now, many of the houses lie empty with gaping holes where the roof once was. “When people decide to leave the village, they roll up the sheets and sell them for a few pounds. Some houses even have mounds of sand piled outside, the graves of their former inhabitants. Malnutrition is the primary cause of death,” explains Chout to Al Jazeera.